Frontier Tank Lines is a major supplier of Diesel Exhaust Fluid. Although the regulations and standards continue to increase, you can rest assured that Frontier Tank Lines is dedicated to meeting your needs. Diesel Exhaust Fluid (DEF) is a vital ingredient of Selective Catalytic Reduction (SCR) systems. It is an aqueous urea solution blended with 32.5% high purity urea and 67.5% deionized water specifically engineered to control nitrogen oxide emissions, which helps diesel vehicles meet strict regulations. Diesel engines run at an overstoichiometric air-to-fuel ratio. It prevents unburnt fuel from being emitted by ensuring the combustion of soot. Excessive oxygen unnecessarily leads to generation of nitrogen oxides. Selective Catalytic Reduction systems use Diesel Exhaust Fluid to reduce the amount of s released into the air. DEF is injected into the exhaust stream at a rate of 2% of diesel consumption volume, governed by a metering system. Although Diesel Exhaust Fluid is clear, non-toxic and safe to handle, it can be corrosive to some metals. Therefore it must be stored stored and transported with care. It should always be stored in a well-ventilated, cool, dry place away from direct sunlight. Diesel Exhaust Fluid (DEF) is only one of the fuels we offer along with our impressive list of services: Emergency Fuel, Fleet Fueling, Inventory Management, Tanks, Transportation, 24Hr On Call Dispatch Teams. 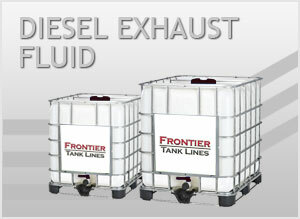 Frontier Tank Lines provides Diesel Exhaust Fuel in a number of dispensing and storage methods. Feel free to contact us today to discuss your Diesel Exhaust Fuel needs.